Sometimes on my personal Facebook page I post pictures of food — doesn’t everybody? I often get requests for my recipes. I am, what I call, a "cupboard cook." In other words, I look to see what is in the cupboard, then I dump it together to make a meal. Sure, I do have a few recipes that I follow, but even then I usually alter them in some way. In my kitchen I try to stay as organic as I can and eat only humanely raised meat. Most of our meals are vegetarian, but we do have meat about once a week. 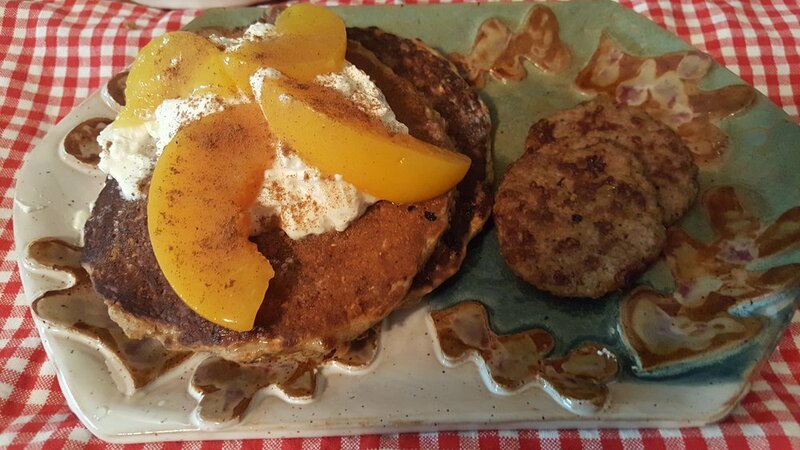 Nearly every Sunday morning I make oatmeal pancakes or waffles for breakfast. So many people have asked for the recipe, I decided to try to share my recipe/process here. So here goes. 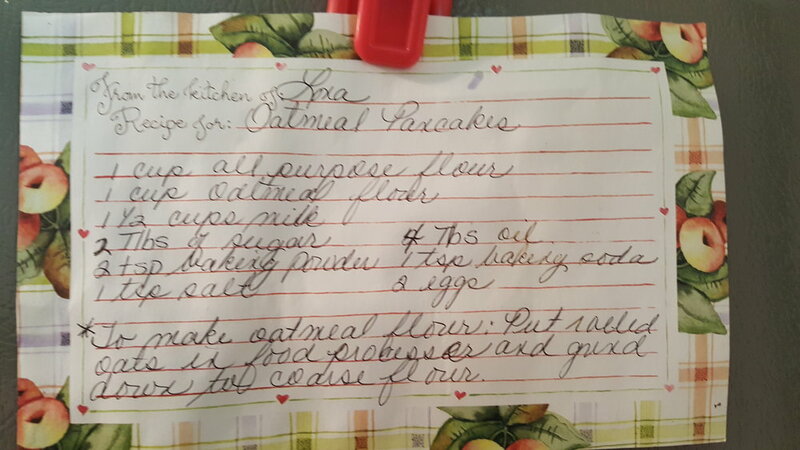 Here is the recipe I began with. It hangs on my refrigerator, along with some other recipes I use often. The original recipe did call for whole rolled oats but unground make it kind of dense, so I started to grind down whole rolled oats in the food processor to make it into a flour and the recipe lighter. I always grind extra oats into flour to keep in a canister on my counter; that way, I only have to make oat flour once a month or so. I do like creating variations of the recipe. Sometimes I add fruit, like blueberries. 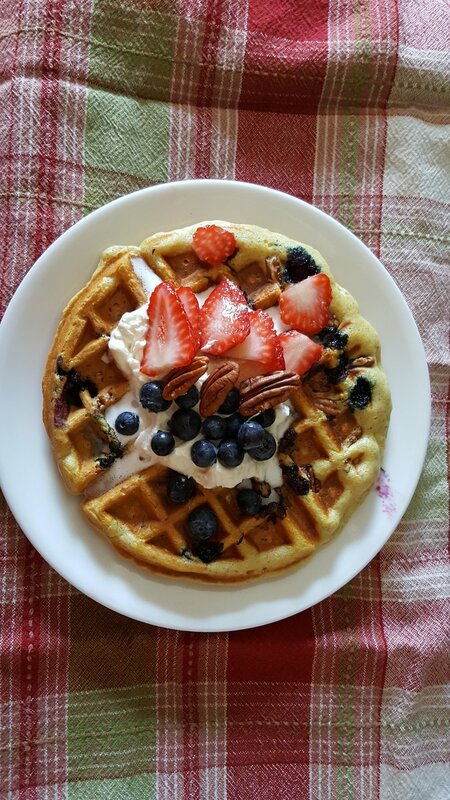 Pecans or walnuts are a great addition. It's also fun to play with spices; pumpkin spice is one of our favorites!! The recipe was was delicious when I added some leftover pumpkin (1/4 - 1/2 cup) that was in my fridge. The point is to have fun with the recipe and just use what you have. Spices can be stirred directly into the batter. I don't add the fruits and nuts to the batter; instead, I put some batter on the griddle, then add the fruit and nuts. That way, it's also easy to customize the recipe for each person. I really like using a nicely-seasoned cast iron griddle to cook my pancakes. Be sure to heat up the skillet before adding spray-on oil or butter. Pour your batter on immediately; this helps to keep it from sticking. You want a hot pan and cool oil. You can use the same process for making waffles. Simply add a little extra liquid; waffle batter should be a bit thinner than pancake batter. 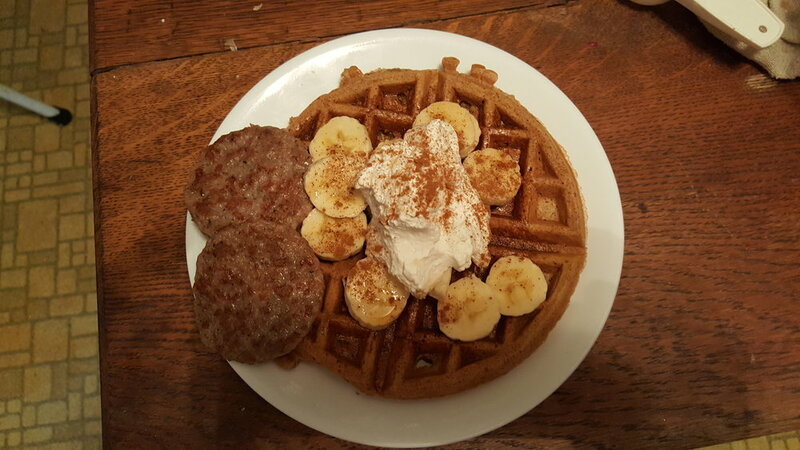 Add some homemade whipped cream, a side of humanely-raised turkey sausage or turkey bacon, and you have a perfect breakfast. I hope this helps a little. If you have any questions, make a comment below and I’ll do my best to answer them.